Meat can be cooked by moist heat or dry heat. What method is used will depend on what type of meat it is, what part of the animal it is from, and what the desired taste and appearance outcome are for the dish being prepared. Moist heat cooking methods are used for parts of an animal that are either low in fat, or tough in musculature because those parts of the animal got a lot of exercise. Moist heat methods are the least well-understood ways of cooking meat. An urban myth has floated around for the past 100 years or so that the purpose of cooking meat in moist heat is to make or keep the meat moist. And for the past 100 years or so, there have been crest-fallen faces at the table when the cooks realized how dry the meat turned out regardless of how much water they used. The truth is, they were misled. Meat won’t absorb water during cooking, it will only exude water. Some studies‡ have shown that because steam can get very hot, allowing hotter temperatures than air would, you can actually lose far more water if you crank your cooking temperature in moist-head methods. The only thing that will make or keep meat moist is fat. When choosing a piece of meat to cook with moist-heat methods, bear in mind that meat meant to be cooked with these methods will be less-tender cuts that therefore need to be cooked longer to tenderize them. With the longer cooking times, they have a greater chance of turning out dry. Consequently, you need to choose a piece of meat with a good piece of fat on one side, and cook it fat side up so that as the fat melts, it will drizzle down through the meat to keep it moist. If there isn’t any fat on any side of it, ask your butcher for a piece of beef fat. Chances are, he or she will beam at you, thinking “finally here’s someone who knows how to cook a piece of meat” and give it to you for free. While it is a myth that moist heat will keep the meat moist, such cooking methods actually do have a purpose. The purpose of the moisture is to help regulate the cooking temperature and keep it reasonable (which means don’t crank the heat — that will just dry your meat out), so that the meat can cook for a long period of time to get tender all the way through without burning on the outside. When people refer to meat being boiled, what they actually mean is that it is simmered. ‡ See: Harold McGee. On Food & Cooking: The Science and Lore of the Kitchen. New York: Simon & Schuster, 1997. Dry heat cooking methods are used for cuts of meat that are tender or delicate. There is general confusion in the English-speaking world about dry heat meat cooking terms. The colloquial definition of barbeque (in Australia, New Zealand, UK, everyday usage in North America) equals the purist definition of grilling (see above.) The food is over a flame. 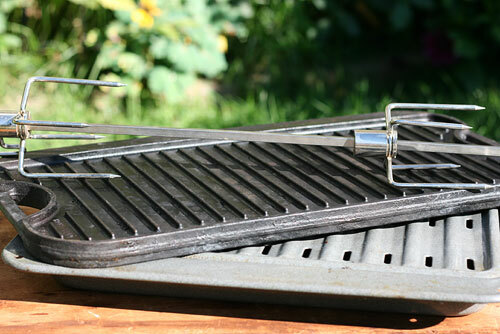 The colloquial definition of grilling (everyday usage in North America) is often confused with griddling (see purist definition above), to make it mean cooking on a hot, flat surface. Grilling in the UK equals putting something under a flame. broil for cooking with intense heat coming from above. Barbequing / Grilling will likely continue for some time to be much disputed words.